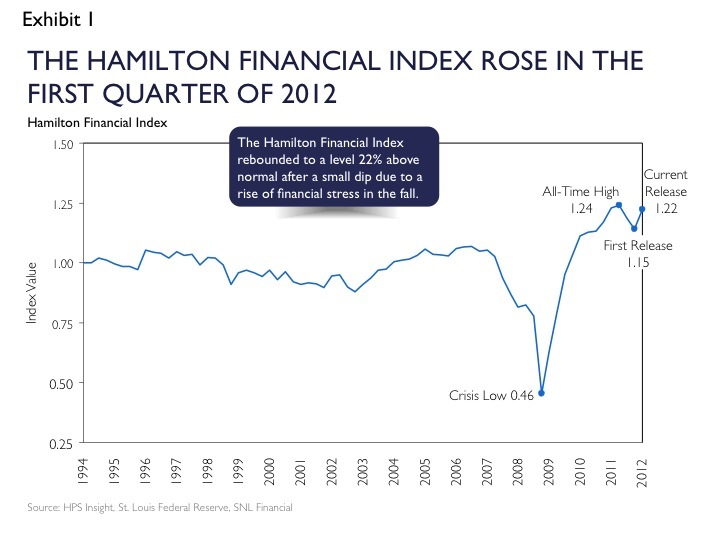 The Hamilton Financial Index (HFI) rose seven points since the previous quarter and stands at 1.22 as of the end of the first quarter. Banks’ increase in Tier 1 capital is driving the rise in the HFI. For the HFI to dip below historical norms, systemic risk would have to increase five times the second quarter high. Conversely, if banks had not increased their Tier 1 Common Capital Ratio from the level of three years ago, the second quarter high of systemic risk would have pushed the HFI below normal levels. ﾠWhile the European debt crisis presents risks to the global economy, from the end of the first quarter of 2011 through the first quarter of 2012, U.S. banks reduced exposure to the European periphery by over 16 percent and Europe as a whole by eight percent. Lastly, our policy spotlight found that the upcoming fiscal cliff could be the largest fiscal contraction in four decades, potentially causing a significant drop in consumer demand and business investment. The fiscal cliff is further complicated by elevated U.S. debt and annual deficits, a politically contentious debt ceiling debate, constraints on the Fed, and the slowing of the global economy.